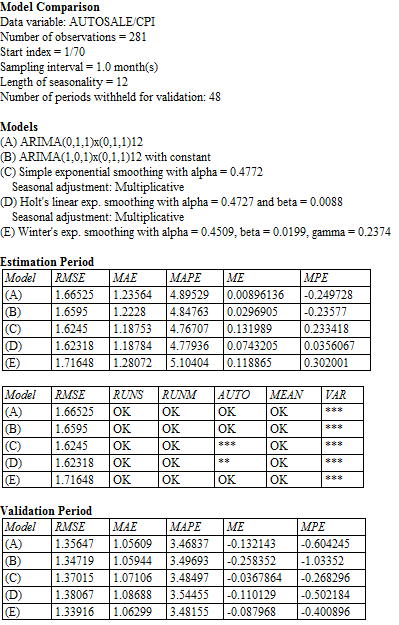 General seasonal ARIMA models -- (0,1,1)x(0,1,1) etc. General seasonal ARIMA models: (0,1,1)x(0,1,1) etc. What are the tradeoffs among the various seasonal models? The seasonal part of an ARIMA model has the same structure as the non-seasonal part: it may have an AR factor, an MA factor, and/or an order of differencing. In the seasonal part of the model, all of these factors operate across multiples of lag s (the number of periods in a season). In identifying a seasonal model, the first step is to determine whether or not a seasonal difference is needed, in addition to or perhaps instead of a non-seasonal difference. You should look at time series plots and ACF and PACF plots for all possible combinations of 0 or 1 non-seasonal difference and 0 or 1 seasonal difference. Caution: don't EVER use more than ONE seasonal difference, nor more than TWO total differences (seasonal and non-seasonal combined). Rule 12: If the series has a strong and consistent seasonal pattern, then you should use an order of seasonal differencing--but never use more than one order of seasonal differencing or more than 2 orders of total differencing (seasonal+nonseasonal). The signature of pure SAR or pure SMA behavior is similar to the signature of pure AR or pure MA behavior, except that the pattern appears across multiples of lag s in the ACF and PACF. For example, a pure SAR(1) process has spikes in the ACF at lags s, 2s, 3s, etc., while the PACF cuts off after lag s.
Conversely, a pure SMA(1) process has spikes in the PACF at lags s, 2s, 3s, etc., while the ACF cuts off after lag s.
Rule 13: If the autocorrelation at the seasonal period is positive, consider adding an SAR term to the model. If the autocorrelation at the seasonal period is negative, consider adding an SMA term to the model. Try to avoid mixing SAR and SMA terms in the same model, and avoid using more than one of either kind. Usually an SAR(1) or SMA(1) term is sufficient. You will rarely encounter a genuine SAR(2) or SMA(2) process, and even more rarely have enough data to estimate 2 or more seasonal coefficients without the estimation algorithm getting into a "feedback loop." Although a seasonal ARIMA model seems to have only a few parameters, remember that backforecasting requires the estimation of one or two seasons' worth of implicit parameters to initialize it. Therefore, you should have at least 4 or 5 seasons of data to fit a seasonal ARIMA model. Probably the most commonly used seasonal ARIMA model is the (0,1,1)x(0,1,1) model--i.e., an MA(1)xSMA(1) model with both a seasonal and a non-seasonal difference. This is essentially a "seasonal exponential smoothing" model. 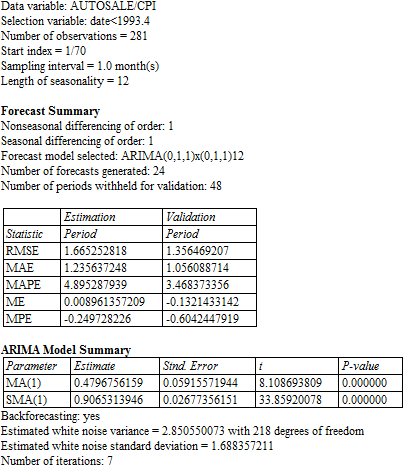 When seasonal ARIMA models are fitted to logged data, they are capable of tracking a multiplicative seasonal pattern. The differenced series (the residuals of a random-walk-with-growth model) looks more-or-less stationary, but there is still very strong autocorrelation at the seasonal period (lag 12). The seasonally differenced series shows a very strong pattern of positive autocorrelation, as we recall from our earlier attempt to fit a seasonal random walk model. This could be an "AR signature"--or it could signal the need for another difference. These are, of course, the residuals from the seasonal random trend model that we fitted to the auto sales data earlier. We now see the telltale signs of mild overdifferencing: the positive spikes in the ACF and PACF have become negative. 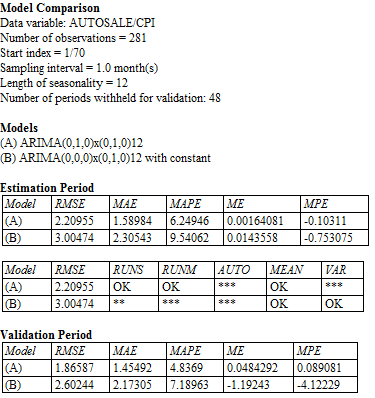 The smallest errors, in both the estimation period and validation period, are obtained by model A, which uses one difference of each type. This, together with the appearance of the plots above, strongly suggests that we should use both a seasonal and a nonseasonal difference. Note that, except for the gratuitious constant term, model A is the seasonal random trend (SRT) model, whereas model B is just the seasonal random walk (SRW) model. As we noted earlier when comparing these models, the SRT model appears to fit better than the SRW model. 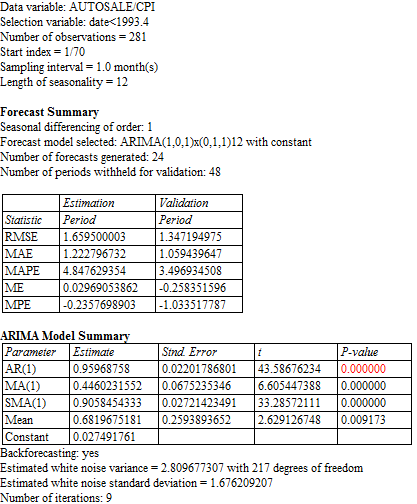 In the analysis that follows, we will try to improve these models through the addition of seasonal ARIMA terms. Return to top of page. where θ1 is the MA(1) coefficient and Θ1 (capital theta-1) is the SMA(1) coefficient. Notice that this is just the seasonal random trend model fancied-up by adding multiples of the errors at lags 1, 12, and 13. Also, notice that the coefficient of the lag-13 error is the product of the MA(1) and SMA(1) coefficients. This model is conceptually similar to the Winters model insofar as it effectively applies exponential smoothing to level, trend, and seasonality all at once, although it rests on more solid theoretical foundations, particularly with regard to calculating confidence intervals for long-term forecasts. What is this model really doing? You can think of it in the following way. First it computes the difference between each month’s value and an “exponentially weighted historical average” for that month that is computed by applying exponential smoothing to values that were observed in the same month in previous years, where the amount of smoothing is determined by the SMA(1) coefficient. Then it applies simple exponential smoothing to these differences in order to predict the deviation from the historical average that will be observed next month. The value of the SMA(1) coefficient near 1.0 suggests that many seasons of data are being used to calculate the historical average for a given month of the year. Recall that an MA(1) coefficient in an ARIMA(0,1,1) model corresponds to 1-minus-alpha in the corresponding exponential smoothing model, and that the average age of the data in an exponential smoothing model forecast is 1/alpha. The SMA(1) coefficient has a similar interpretation with respect to averages across seasons. Here its value of 0.91 suggests that the average age of the data used for estimating the historical seasonal pattern is a little more than 10 years (nearly half the length of the data set), which means that an almost constant seasonal pattern is being assumed. The much smaller value of 0.5 for the MA(1) coefficient suggests that relatively little smoothing is being done to estimate the current deviation from the historical average for the same month, so next month’s predicted deviation from its historical average will be close to the deviations from the historical average that were observed over the last few months. The additional term on the right-hand-side is a multiple of the seasonal difference observed in the last month, which has the effect of correcting the forecast for the effect of an unusually good or bad year. Here ϕ1 denotes the AR(1) coefficient, whose estimated value is 0.73. Thus, for example, if sales last month were X dollars ahead of sales one year earlier, then the quantity 0.73X would be added to the forecast for this month. μ denotes the CONSTANT in the forecasting equation, whose estimated value is 0.20. The estimated MEAN, whose value is 0.75, is the mean value of the seasonally differenced series, which is the annual trend in the long-term forecasts of this model. The constant is (by definition) equal to the mean times 1 minus the AR(1) coefficient: 0.2 = 0.75*(1 – 0.73). This is nearly the same as the ARIMA(0,1,1)x(0,1,1) model except that it replaces the nonseasonal difference with an AR(1) term (a "partial difference") and it incorporates a constant term representing the long-term trend. Hence, this model assumes a more stable trend than the ARIMA(0,1,1)x(0,1,1) model, and that is the principal difference between them. The estimated MEAN of 0.68 is the predicted long-term trend (average annual increase). This is essentially the same value that was obtained in the (1,0,0)x(0,1,0)-with-constant model. The standard error of the estimated mean is 0.26, so the difference between 0.75 and 0.68 is not significant. If the constant was not included in this model, it would be a damped-trend model: the trend in its very-long-term forecasts would gradually flatten out. The error statistics for the one-period-ahead forecasts for all the models are extremely close in this case. It is hard to pick a “winner” based on these numbers alone. Return to top of page. What are the tradeoffs among the various seasonal models? The three models that use multiplicative seasonal adjustment deal with seasonality in an explicit fashion--i.e., seasonal indices are broken out as an explicit part of the model. The ARIMA models deal with seasonality in a more implicit manner--we can't easily see in the ARIMA output how the average December, say, differs from the average July. Depending on whether it is deemed important to isolate the seasonal pattern, this might be a factor in choosing among models. The ARIMA models have the advantage that, once they have been initialized, they have fewer "moving parts" than the exponential smoothing and adjustment models and as such they may be less likely to overfit the data. ARIMA models also have a more solid underlying theory with respect to the calculation of confidence intervals for longer-horizon forecasts than do the other models. There are more dramatic differences among the models with respect to the behavior of their forecasts and confidence intervals for forecasts more than 1 period into the future. This is where the assumptions that are made with respect to changes in the trend and seasonal pattern are very important. Between the two ARIMA models, one (model A) estimates a time-varying trend, while the other (model B) incorporates a long-term average trend. (We could, if we desired, flatten out the long-term trend in model B by suppressing the constant term.) Among the exponential-smoothing-plus-adjustment models, one (model C) assumes a flat trend, while the other (model D) assumes a time-varying trend. The Winters model (E) also assumes a time-varying trend. Models that assume a constant trend are relatively more confident in their long-term forecasts than models that do not, and this will usually be reflected in the extent to which confidence intervals for forecasts get wider at longer forecast horizons. Models that do not assume time-varying trends generally have narrower confidence intervals for longer-horizon forecasts, but narrower is not better unless this assumption is correct. The two exponential smoothing models combined with seasonal adjustment assume that the seasonal pattern has remained constant over the 23 years in the data sample, while the other three models do not. Insofar as the seasonal pattern accounts for most of the month-to-month variation in the data, getting it right is important for forecasting what will happen several months into the future. If the seasonal pattern is believed to have changed slowly over time, another approach would be to just use a shorter data history for fitting the models that estimate fixed seasonal indices. The point forecasts are actually surprisingly close to each other, relative to the widths of all the confidence intervals. The SES point forecast is the lowest, because it is the only model that does not assume an upward trend at the end of the series. The ARIMA (1,0,1)x(0,1,1)+c model has the narrowest confidence limits, because it assumes less time-variation in the parameters than the other models. Also, its point forecast is slightly larger than those of the other models, because it is extrapolating a long-term trend rather than a short-term trend (or zero trend). The Winters model is the least stable of the models and its forecast therefore has the widest confidence limits, as was apparent in the detailed forecast plots for the models. 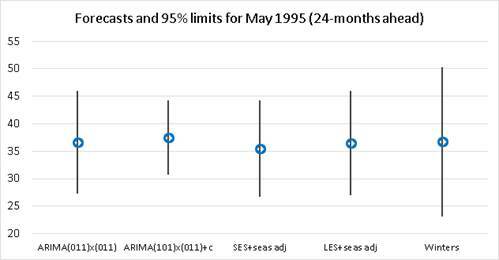 And the forecasts and confidence limits of the ARIMA(0,1,1)x(0,1,1) model and those of the LES+seasonal adjustment model are virtually identical! To log or not to log? Something that we have not yet done, but might have, is include a log transformation as part of the model. 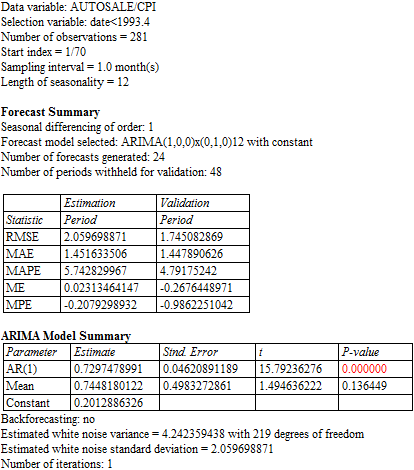 Seasonal ARIMA models are inherently additive models, so if we want to capture a multiplicative seasonal pattern, we must do so by logging the data prior to fitting the ARIMA model. (In Statgraphics, we would just have to specify "Natural Log" as a modeling option--no big deal.) In this case, the deflation transformation seems to have done a satisfactory job of stabilizing the amplitudes of the seasonal cycles, so there does not appear to be a compelling reason to add a log transformation as far as long term trends are concerned. If the residuals showed a marked increase in variance over time, we might decide otherwise. There is still a question of whether the errors of these models have a consistent variance across months of the year. If they don’t, then confidence intervals for forecasts might tend to be too wide or too narrow according to the season. The residual-vs-time plots do not show an obvious problem in this regard, but to be thorough, it would be good to look at the error variance by month. If there is indeed a problem, a log transformation might fix it. Return to top of page.